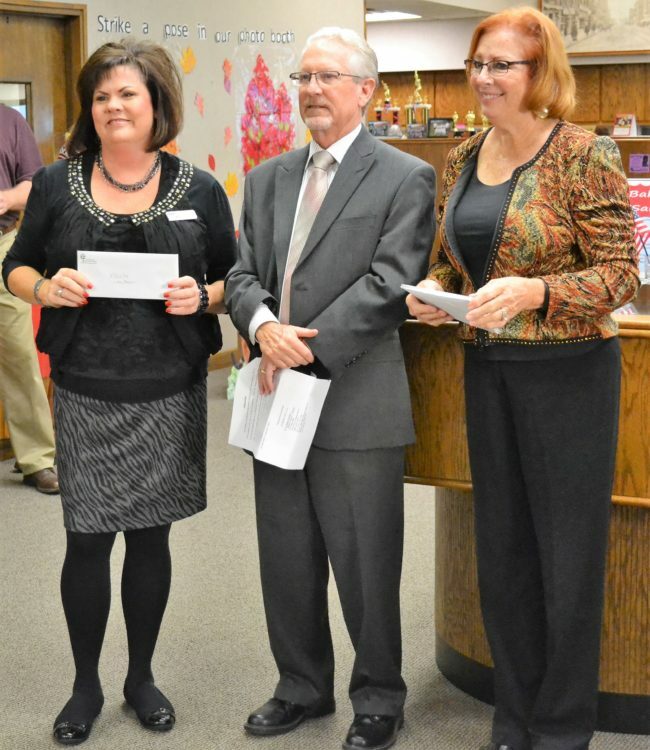 2017 Fort Scott Area Community Foundation grant award recipients received checks Thursday during a presentation at the weekly Chamber of Commerce coffee. 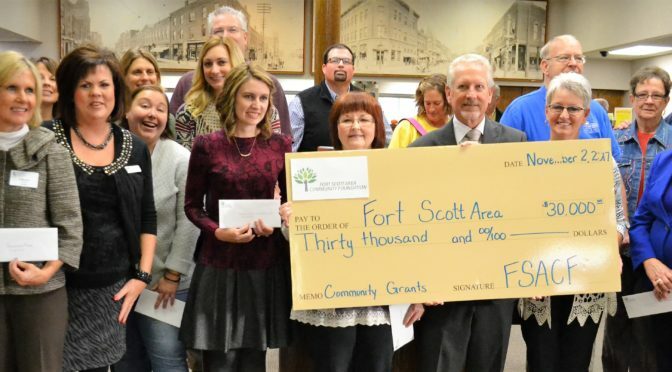 Local helping agencies, businesses, and organizations were presented with grant awards Thursday morning as part of the Fort Scott Area Chamber of Commerce weekly coffee, at the Landmark Bank in downtown Fort Scott. Hudson said a new fundraising campaign is set to begin with FSACF. This year, 29 entities submitted grant applications this year, with 18 funded, he said. 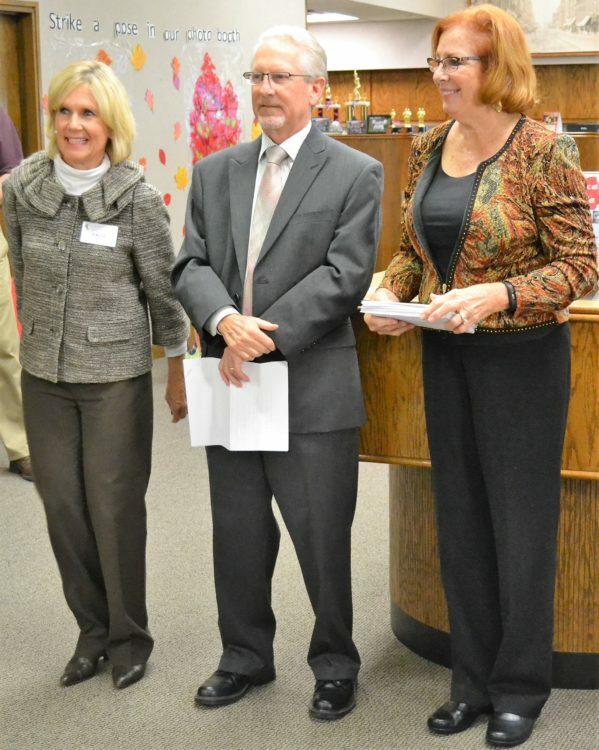 Grant committee members are Hudson, Stephanie Witt, Greg Mottley, Larry Seals, Patty LaRoche and adviser, Dave Martin. LaRoche is committee chair of the granting committee. 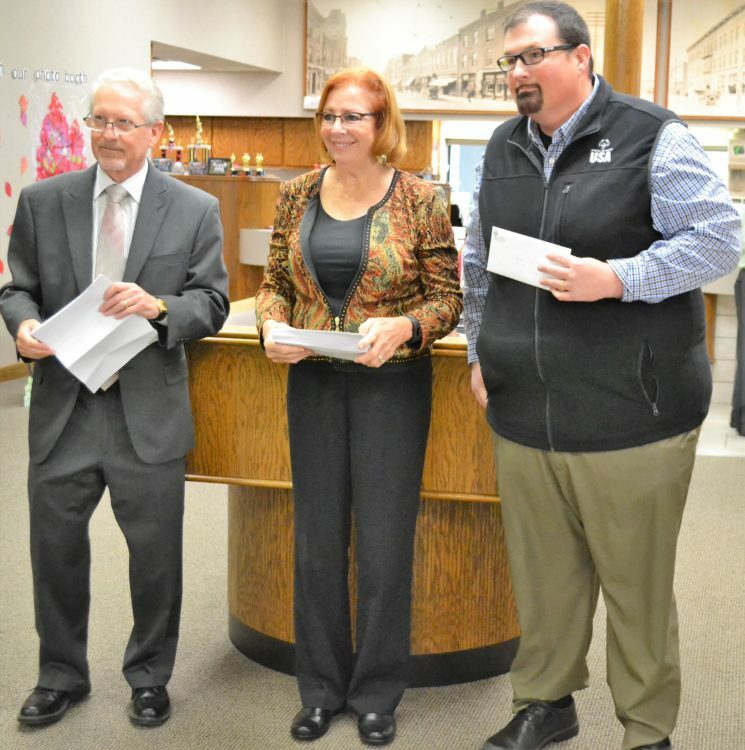 Tri-Valley Developmental Services’ Tim Cunningham receives a check from Fort Scott Area Community Foundation Board Members Blake Hudson and Patty Laroche. 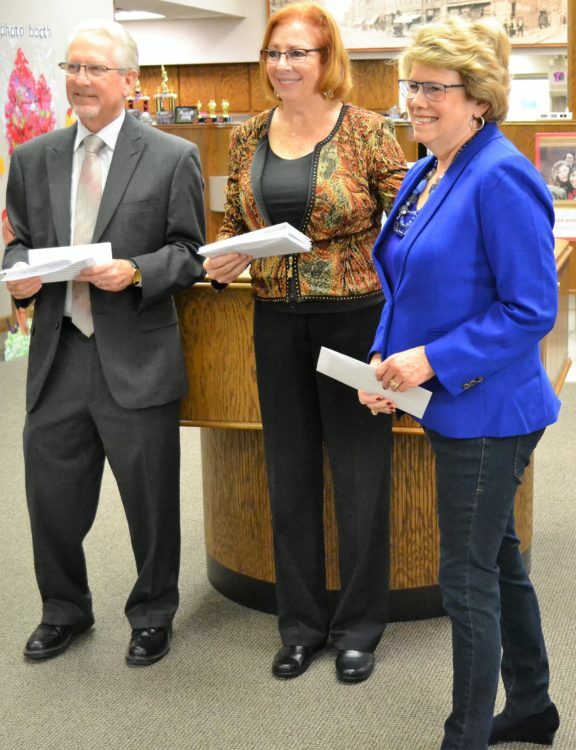 Tri-Valley will replace several aging computers with the money. 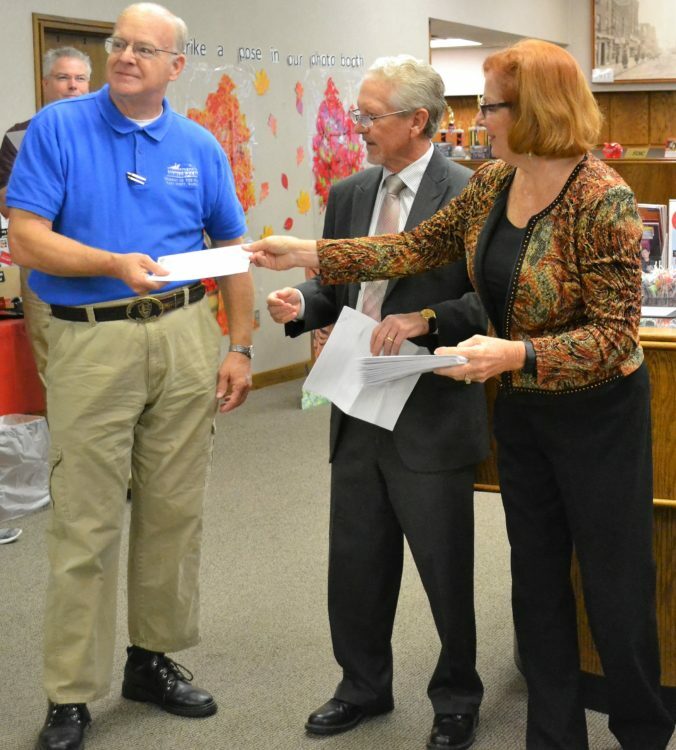 John Lair, right, representing Special Olympics, received a check for purchasing medals for entrants in the special event. 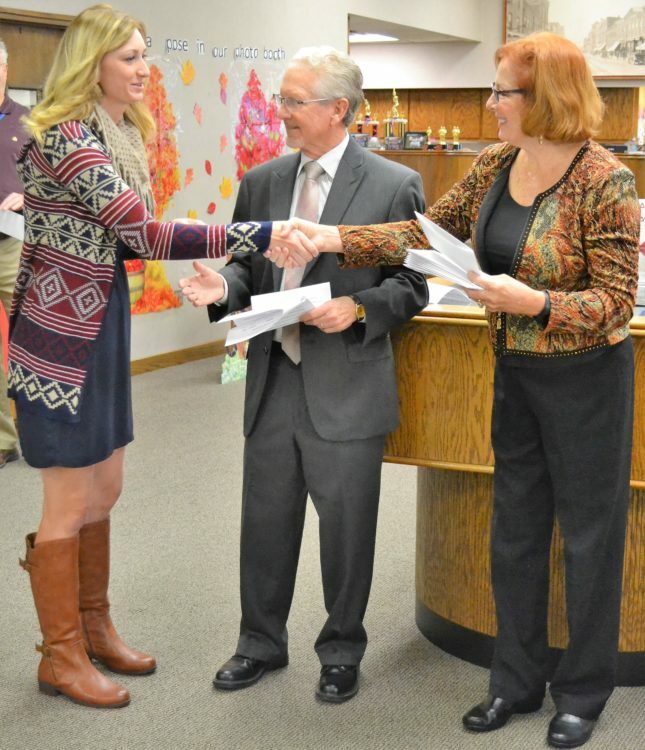 Christa Horn, left, Court Appointed Special Advocates, received a grant for training new volunteers. 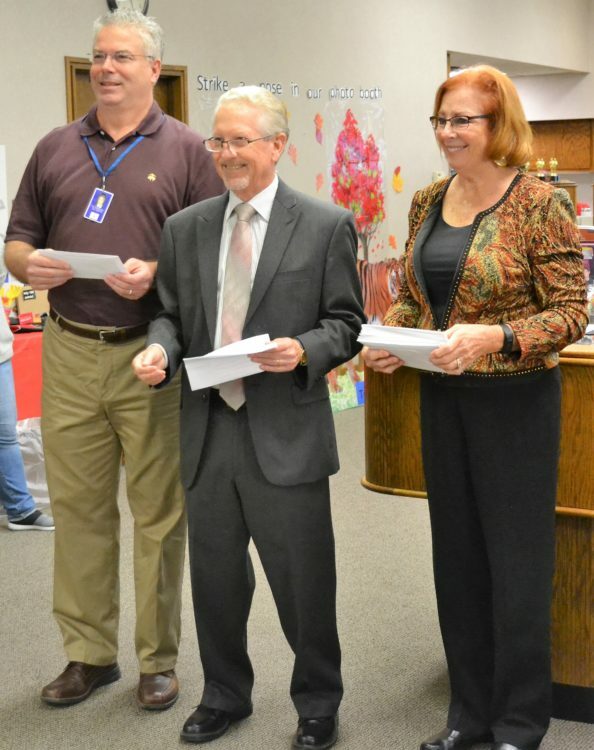 Reed Hartford, left, receives a grant award representing the Friends of Fort Scott National Historic Site, to provide teen internships for the fort. Cheryl Larson, left, representing Presbyterian Manors, receives a check to create an arbor and garden area for residents. 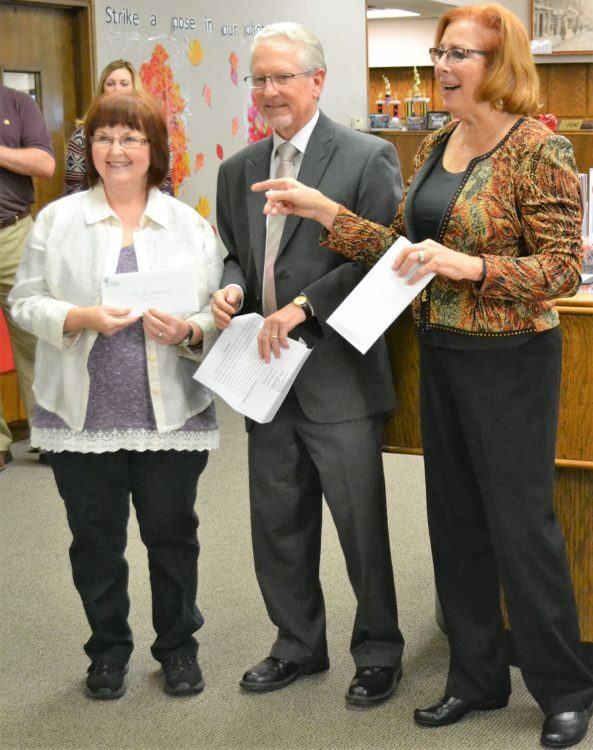 Meredith Reid, left, receives a check to help refurbish the local school district’s grand piano. She is representing Friends of U.S.D. 234. 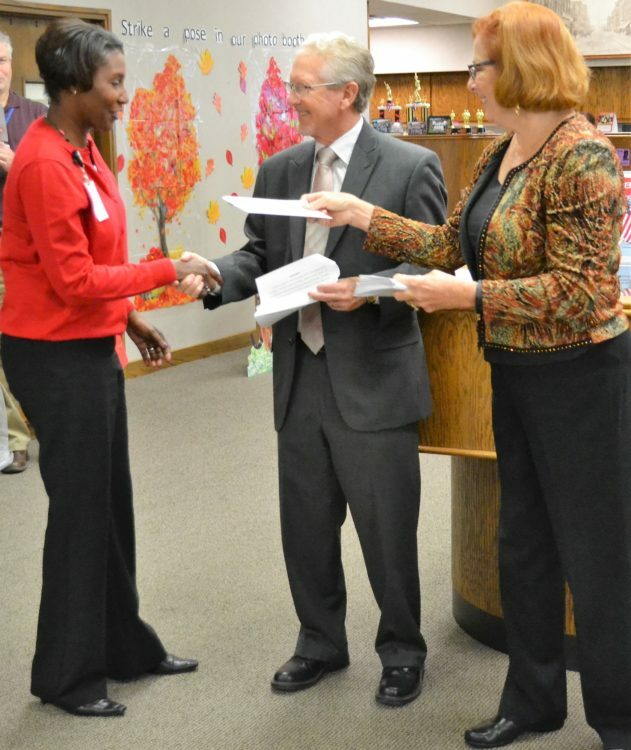 LaShawn Noel, left, receives a check to purchase caregiver’s training journals for stressed-out caregivers. She is representing Mercy Hospital. Elaine Buerge, right, receives a check for the Bourbon County Arts Council to help fund an art fair at the 2nd Story Festival of Arts and Ideas. 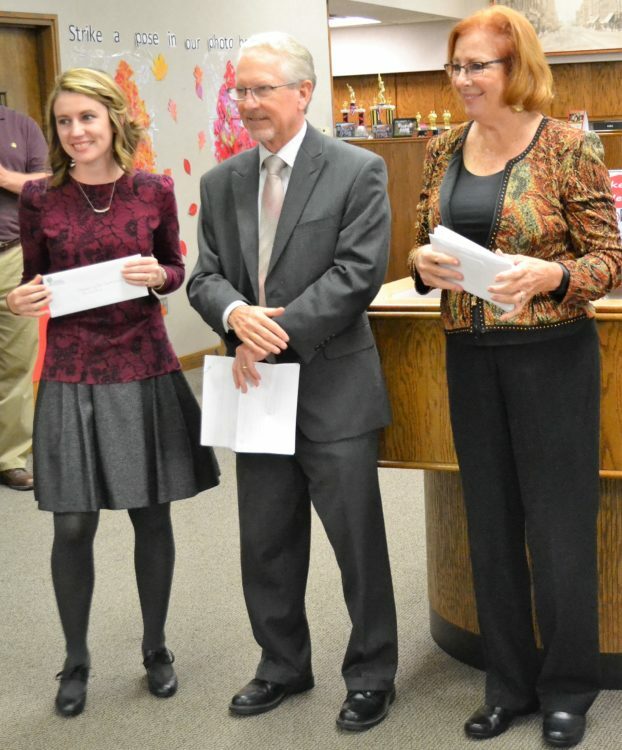 Briann Martin, left, representing Fort Scott Festival of Arts, receives a check to help local and regional students become involved in the festival. Lowell Milken’s Center for Unsung Heroes’ Jessica Schenkel receives a check to purchase local author Kathy Werling’s book on bullying, to be used in classrooms and libraries. 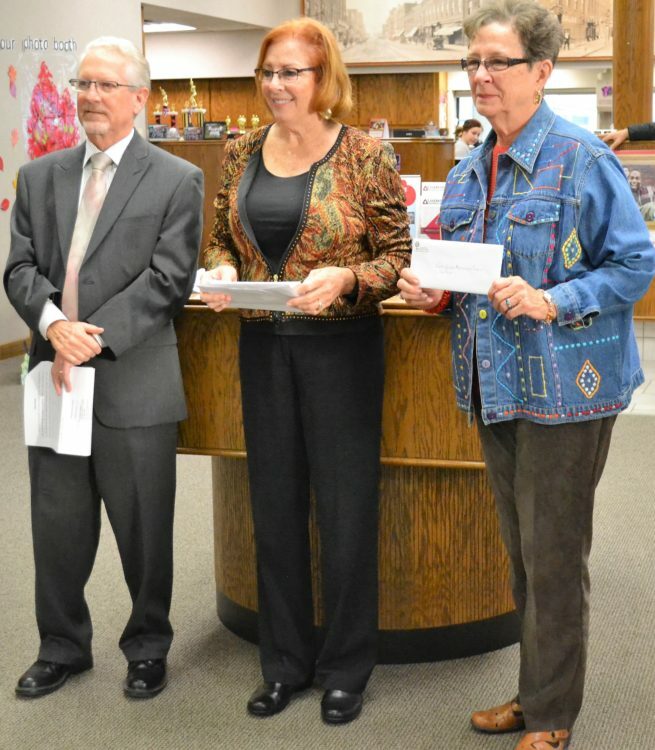 Representatives for Friends of Two Girls and a Zoo, left, receive a check to promote the well-being and support of the zoo’s animals. 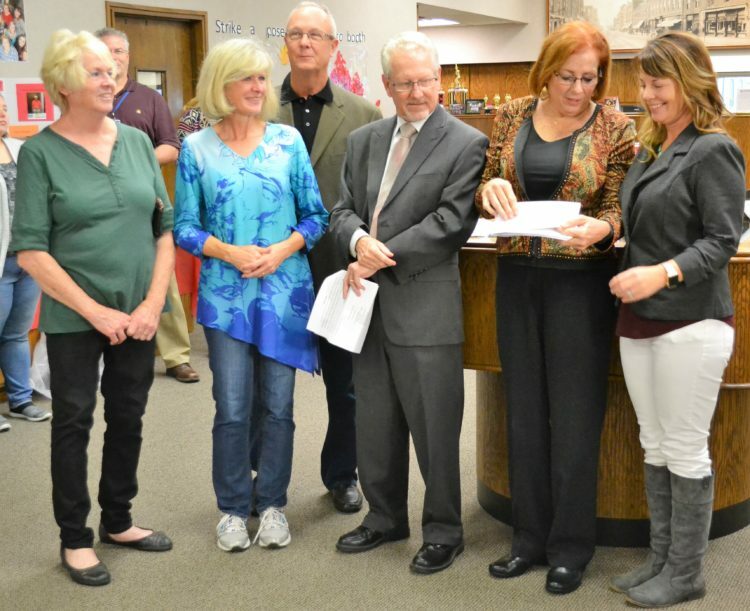 Representatives of the City of Fort Scott receive grant money for lights for the pickle-ball courts. 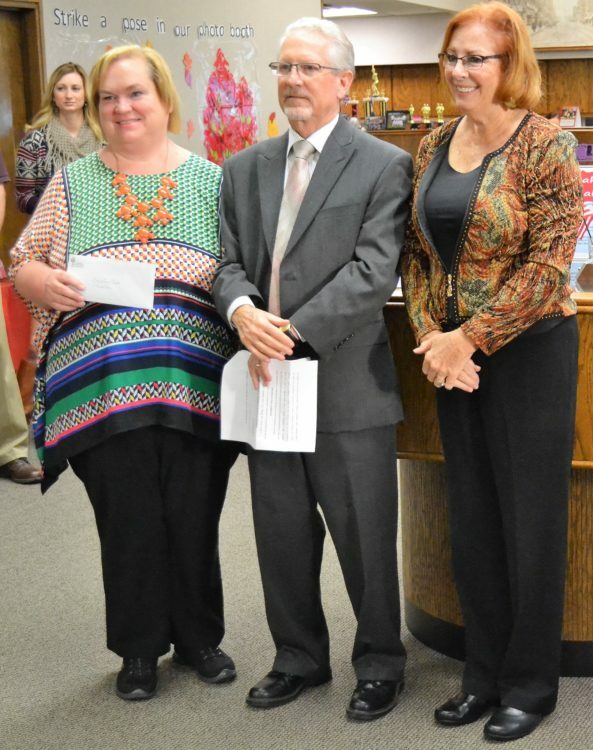 Lindsay Madison, left, receives a check to provide adult mentors with materials to partner with students interested in a specified career. She is representing U.S.D. 234 and the Chamber who collaborate in the program. 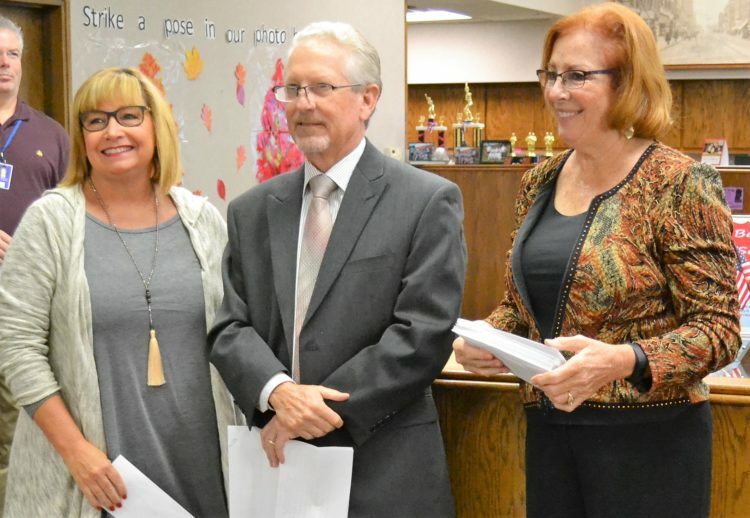 Janet Tucker, left, representing Kansas Seventh-Day Adventists, receives grant money to provide bags and comfort items for kids who are displaced from their home. Jean Tucker, right, receives a check for Feeding Families in His Name, to help fund a free weekly meal provided for impoverished families. 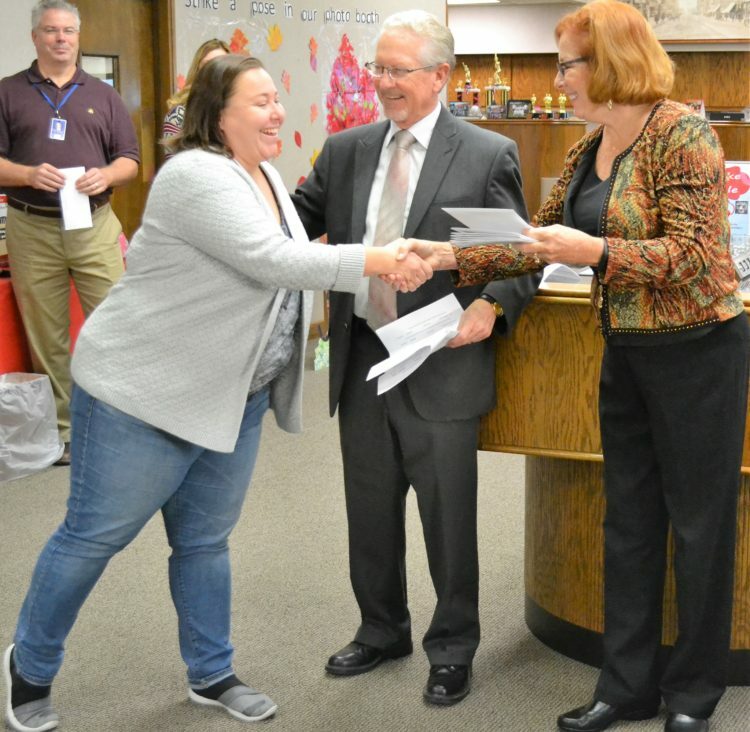 City of Fort Scott’s Rhonda Dunn, left, receives a check to develop a Land Bank to help make decisions about property management in an effort to renovate dilapidated, tax-forclosed properties. Lavetta Simmons, right, receives grant money to help meet the financial needs of families stricken with cancer. She is representing Care to Share. The Beacon inadvertently did not receive a check at the coffee and will at a later date. 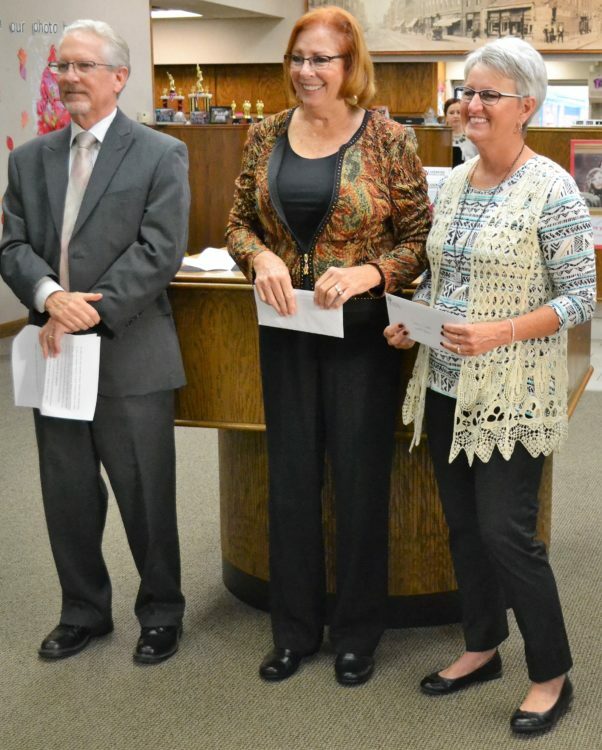 The helping agency received a grant to add healthy food additions to the food pantry they facilitate.